We are committed to improving the lives of cats around the world. International Cat Care works to create a world in which 'all cats, owned and unowned, are treated with care, compassion and understanding'. Founded in 1958 as the Feline Advisory Bureau, International Cat Care is a respected and trusted authority on feline health, behaviour, welfare and best practice. We offer information, advice and training for owners, vets and other professionals around the world. thoroughly researched information and advice for cat owners. We use our unrivalled expertise to raise standards of feline care and find lasting solutions to the serious problems faced by cats globally. If there is one organisation your cat would want you to know about, it's International Cat Care. Katzenworld is all about being a fun, informative place that promotes all things cats. Cat Cafes - a cafe where cats are watched and played with for a cover fee. Katzenworld welcomes its cat-loving community with open arms and provides a forum where stories, hints and tips are shared. We’ve carefully listened to our followers, and through their suggestions and feedback, fun-themed posts such as the Friday Art Cat, Tummy Rub Tuesday and Purrsday Poetry have been introduced. They have now become popular permanent editions to the regular schedule. Katzenworld was founded by Marc-André Runcie-Unger and his close friends Yuki Chung & Laura Haile. It all started over a board game one evening at Marc’s place back in 2014. He and his partner had just adopted two shelter cats (Oliver & Nubia), and as Yuki was already looking after her own cats, the chat soon turned into a great discussion about cats. Back then there weren’t many community-focused online publications so a plan was developed to change all that! 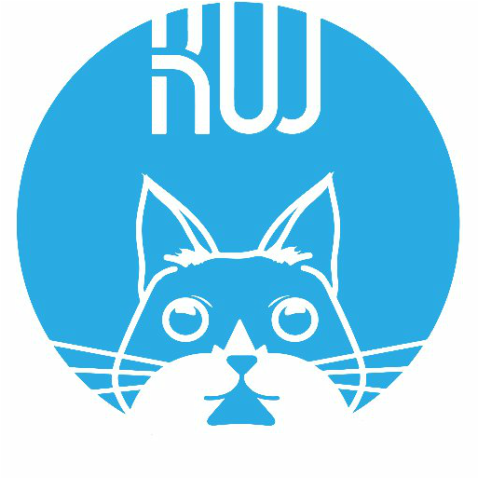 Yuki is a professional illustrator and she produced the original Katzenworld artwork as well as the iconic Katzenworld logo. Sadly work obligations have meant that Yuki is unable to commit time to the project at the moment, but she will be back. As with many great new ideas, what started out as a small group of people soon became a large community project. Today, Katzenworld’s team consists of Lisa, Carol (US), Marc & Iain, Zoey and Rachel (UK), Charlotte (Finland), Ann-Kristin (Germany) and Laura (Japan). To learn more about them and their cats, check out the About Us page. But the growth of this cat-loving community hasn’t stopped there. In addition to the actual Katzenworld team, there are currently 85 active contributors from countries all across the world. They submit content on a regular basis plus many more guest bloggers who also submit content from time to time. If this is the first time you’ve heard of us please come along and join us at Katzenworld, I think you’ll love it!